A new Republican president with a background in the entertainment business was trying to jump-start the U.S. economy out of a brutal recession. The president pushed tax cuts. Then his administration had to come up with a plan to deal with trade. America’s auto industry was suffering, as new competition came in from Japan. What the Reagan administration did about it has shaped the auto industry we see today in America. And it could serve as an example for the Trump administration in its ongoing, rancorous trade battles. The man that President Ronald Reagan put in charge of his trade policy in 1981 was William Brock. Brock says that, at that time, Congress was looking to take tough action to stop Japanese car imports. He went to the Japanese and proposed a different solution. “The thought was that if Japan would put some quiet, voluntary limits on their shipments, it would help ease the problem until we could walk through a transition period,” Brock says. This idea is what’s known as a voluntary export restraint. Instead of a tariff, which acts as a tax on imports, the restraint is more like a voluntary quota. The Japanese carmakers agreed they wouldn’t send more than certain amount of cars to the U.S. each year. The original deal was supposed to last three years. It ended up lasting more than a decade. But the point was it was a negotiated, long-term deal. Companies and customers could expect it wouldn’t go away in a flash, like a tariff can. With the Japanese restraints in place, General Motors, Ford and Chrysler rebounded. In 1984, Reagan made a trip to a Ford plant in Missouri. He told workers there that some had urged him to take a harsher approach to Japanese imports — to push tariffs instead of voluntary agreements. “I believe if Americans work together to improve quality, become more productive, hold down costs and invest in tomorrow’s technology, then we can outcompete, outperform and outsell the pants off anybody,” he said. A study published in 1999 found that the voluntary restraints boosted profits for the Detroit automakers by about $1.6 billion. That’s mostly because it made Japanese imports more expensive. So there’s also a case that it hurt consumers. 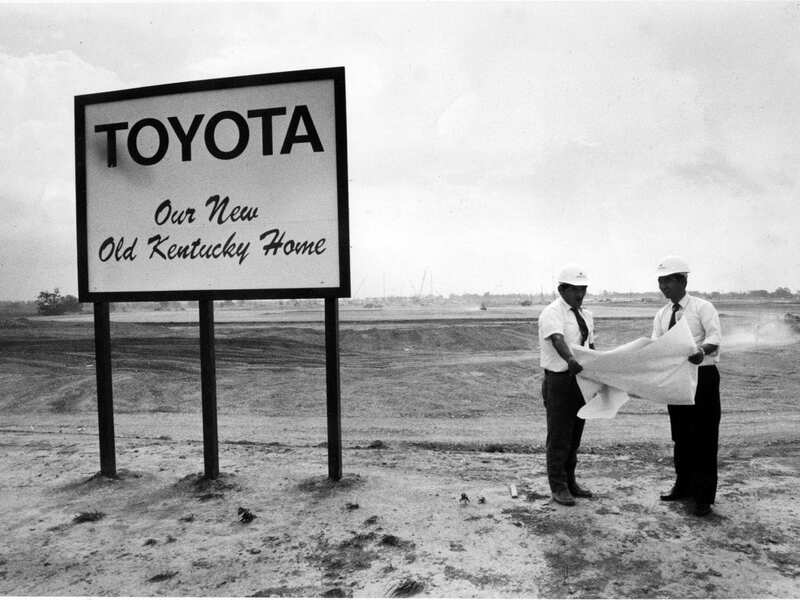 But the biggest and longest lasting impact of the policy can still be seen today in Georgetown, Ky., Smyrna, Tenn., and Marysville, Ohio — places where Toyota, Nissan and Honda all built plants in the 1980s. Susan Helper, an economist at Case Western Reserve University who has studied the auto industry, says the carmakers might have moved production to the U.S. at some point anyway. But the trade policy made it more urgent. But, she says, the voluntary restraints weren’t perfect. When the new plants came in, she says, they didn’t come with the same protections for workers that had been established at the big Detroit automakers. They were, and are, nonunion shops. “Some of the only nonunion automotive plants in the world are in the United States, as a result of this policy,” Helper says. So, one lesson for today’s ongoing trade disputes, at least according to Helper, is to make worker protections part of the policy. William Brock disagrees with this take. He says new automotive jobs in the United States were a good thing. Getting involved in wages and benefits isn’t what the government should be doing. But another big lesson from the Reagan policy in the 1980s is just how long the impacts can last. The restraints Brock negotiated in 1981 led to investments in the U.S. that are still here — and still affecting the economy 37 years later.